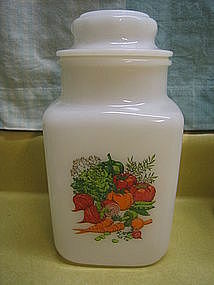 Vintage milk glass canister in a 64 ounce (1/2 gallon) size. There are no chips, cracks or breaks, shows slight age yellowing to the plastic seal. The mold lines are somewhat rough, but not from damage, but a manufacturing issue. Other sizes from my original set are available for purchase and priced individually. I need your zip code to calculate the postage.